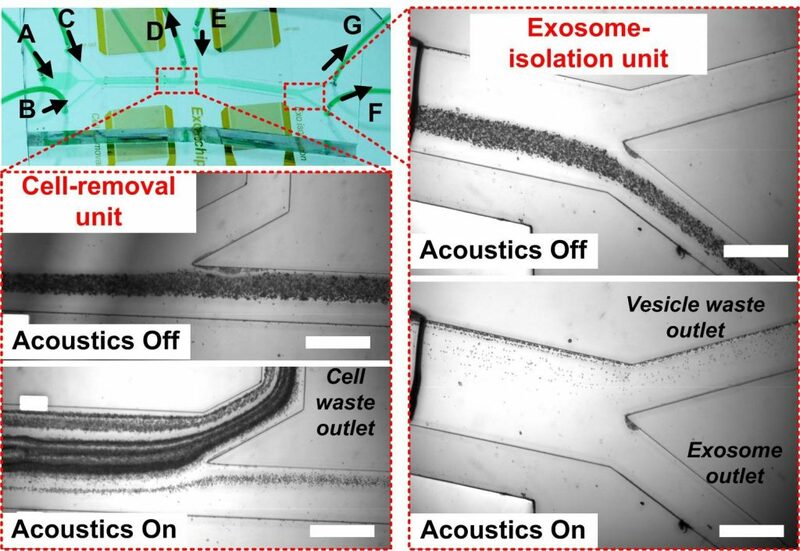 Figure 2: Isolation of exosomes using the integrated acoustic device. In experiments, inlet A is for whole blood; inlets B, C and E are for sheath flows. Outlet D is cell waste. Outlets F and G are for isolated exosomes and vesicle waste, respectively. Images are taken under microscope at corresponding areas of the device. Blood components are directed to each corresponding outlet when the acoustic wave is on. Exosomes are nanoscale extracellular vesicles that play an important role in many biological processes, including intercellular communications, antigen presentation, and the transport of proteins, RNA, and other molecules. We developed a separation method based on acoustofluidics (i.e., the integration of acoustics and microfluidics) to isolate exosomes directly from biofluids (such as whole blood) in a label-free and contact-free manner. This acoustofluidic platform (Fig. 2) consists of two modules. Micro-scale blood components are first removed by the cell-removal module, followed by extracellular vesicle subgroup separation in the exosome-isolation module. In the cell-removal module, we demonstrate the isolation of 110 nm particles from a mixture of micro- and nano-sized particles with a yield greater than 99%. In the exosome-isolation module, we isolate exosomes from an extracellular vesicle mixture with a purity of 98.4%. Integrating the two acoustofluidic modules onto a single chip, we isolated exosomes from whole blood with a blood cell removal rate of over 99.999%. With its ability to perform rapid, biocompatible, label-free, contact-free, and continuous-flow exosome isolation, the integrated acoustofluidic device offers a unique approach to investigate the role of exosomes in the onset and progression of human diseases with potential applications in health monitoring, medical diagnosis, targeted drug delivery and personalized medicine.